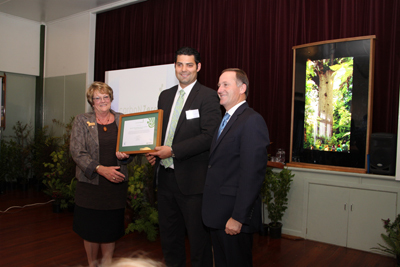 The Kauri Museum in Matakohe, Northland, has become the first museum in the world to achieve carboNZero certification. With support from carboNZero Holdings, the Kauri Museum has identified its organisational carbon footprint, committed to reduce emissions through implementing management plans, and purchased verified carbon credits to offset remaining unavoidable greenhouse gas emissions. ‘To take our museum further forward, and to answer those long distance travellers who find the story of the demise of the kauri trees sad, it became our goal to be the world’s first carboNZero certified museum,’ said CEO of the Kauri Museum, Bet Nelley. CarboNZero certification was developed from over a decade of research at New Zealand Crown Research Institute, Landcare Research. Certification demonstrates that the greenhouse gas emissions associated with the Kauri Museum have been measured and independently verified in accordance with international standards. It recognises their commitment to continuously manage and reduce their emissions and allows them to offset remaining emissions through the EBEX 21 native forest restoration project. ‘The debate on global warming, I would rather leave that to the scientists. But what I do understand, and what convinced me to fight for carboNZero status is simple. If the majority of scientists and our government are right, and global warming is taking place then every day is urgent and I would hate to have to explain to my grandchildren that we had the opportunity to do something, yet did nothing. If the sceptics turn out to be right, then in 20 years time we will simply have a better planet for our grandchildren to inherit,’ says Bet. As part of achieving certification for their organisation, the museum has become leaner and meaner in their energy use. This will save on operating costs.